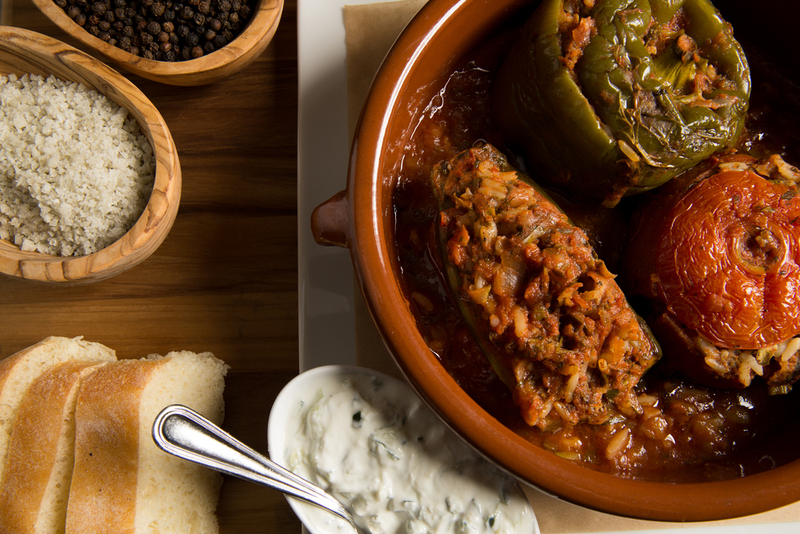 Voted Top 100 Best Greek Restaurants in the U.S.
Greek food is so much more than gyros. Don’t get us wrong – There is something heavenly about the combination of tenderly seasoned meat wrapped in a warm, fluffy pita. But there's more to Greek Cuisine than that. Growing up with Greek flavors, visiting the gorgeous mountains and sea scapes of my family’s ancestral home on the island of Crete, I discovered the difference of making simple food with the very best ingredients. The notions of “Farm-to-table,” “hand-crafted,” and “artisan” have always been a part of Cretan cuisine. Simply seasoned with wild herbs, garden-grown produce, and the finest olive oil (made from olive trees that are 4,000 years old), the freshest seafood, meats, and homemade cheese make an enormous difference. That’s why we import the best Cretan olive oil to use in every single dish. We grind our own meat, we source the best seafood and we grow/ dry our own mint and greens…you get the idea. Taking such care may be more labor intensive. Ingredients may cost us more. But in the end, it re-creates the best and most authentic Greek flavors for everyone to discover and enjoy. Before it was "in", whatever you caught in the sea, grew in the garden or raised on your land is what you served. Cretan style Greek cuisine is a culture, not just a definition. With ten years in operation, Greek familial roots, and months of research in Greece dining at over 80 establishments, Aristo brings a culmination of his authenticity and experience to your dining. Staying true to culture and tradition, we do things the old fashioned way. We grow our own herbs, make our own cheese, kneed our own dough and butcher our own meats. Aristo's dream became a reality when he signed a 22 year lease for a his very own restaurant. With his name on the building, and a lease longer than the time he had been alive, failure was not an option. Aristo is dedicated to creating the finest dining experience with the highest quality cuisine. Utilizing family recipes while combining the techniques and skills he has acquired over years of traveling, allows his restaurant to be authentically innovative. Aristo's is truly a family owned and operated restaurant with a menu reflecting impeccable attention to detail, labor intensive preparation and dedication to the freshest ingredients.